You won't miss the actual meat part of this grilled portobello burger because it's loaded with healthy benefits and packed full of flavor. 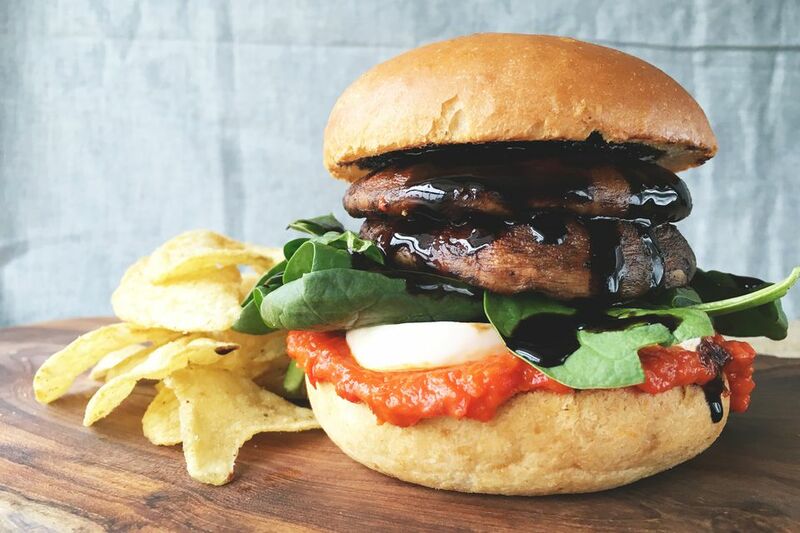 Made with garlicky grilled portobello mushroom caps, a sweet and savory roasted red pepper tapenade, fresh mozzarella cheese, crisp baby spinach, and sweet balsamic glaze and stacked between two halves of a toasted brioche bun, this sandwich is no joke. In a small bowl, whisk together olive oil, balsamic vinegar, mustard, salt, pepper, and garlic powder. Brush both sides of each portobello mushroom caps with the marinade and let sit for at least 20 minutes. Grill marinated portobello caps for a few minutes on each side until the mushroom is tender and cooked through. Set aside. Add the roasted red peppers, olive oil, salt, lemon juice, sugar and garlic to a blender and pulse until smooth. Set aside. Cut the brioche bun in half and toast. Smear the roasted red pepper tapenade on the bottom half of the toasted brioche, then add mozzarella, the spinach, the grilled portobello caps and the balsamic glaze. Serve immediately.